Positioned on the edge of a 250-metre high dune, the Dune Camp sleeps a maximum of 12 guests in a totally unspoilt setting. 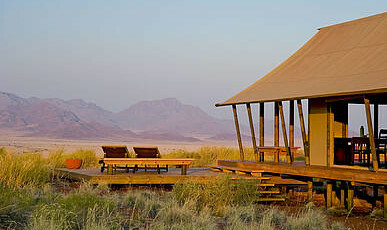 Guests stay in comfortable dome-shaped tents pitched on wooden platforms, each furnished with standard beds (covered with down duvets), bedside tables and a suitcase rack. A spacious veranda, allowing for safe sleep-outs under the stars, and a private bathroom fitted with a hot shower, two washbasins and flush toilet make for a rather civilized camping experience. The sun-downer deck with its elevated fireplace is the central meeting point of the camp providing a cosy and relaxed ambiance. The camp requires a minimum stay of two nights.